Mexico’s treasured Nortec Collective is a puzzle with a myriad of individual musicians and artists pieced together to create a larger masterpiece. One of these pieces is Jorge Verdin, better known as Clorofila. Harnessing the Nortec sound without sounding like another Tijuana Sessions Vol. 3 is no small feat, considering the accolades showered on the 2005 release, but Verdin is up to the challenge. Though known as a graphic artist — he has a degree in design, after all — Verdin has been recording so-called “weird sounds” since he was a kid. 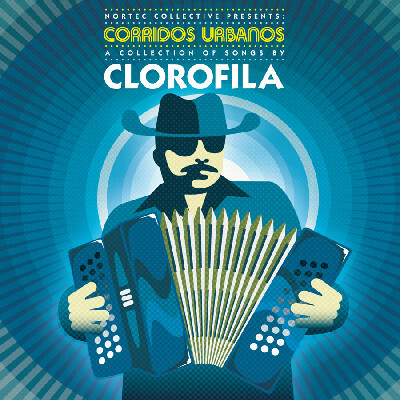 Whereas the collective traditionally draws on the norteno sound, on his corridos — which are popular folkloric songs about gangsters and drugs — Clorofila presents a banda blowout loaded with bass and brassy notes. As a hidden saxophone jabs through the soundscape, string arrangements ease into 8-bit sounds before giving way to accordion squeezes for an invigorating pastiche of tracks.